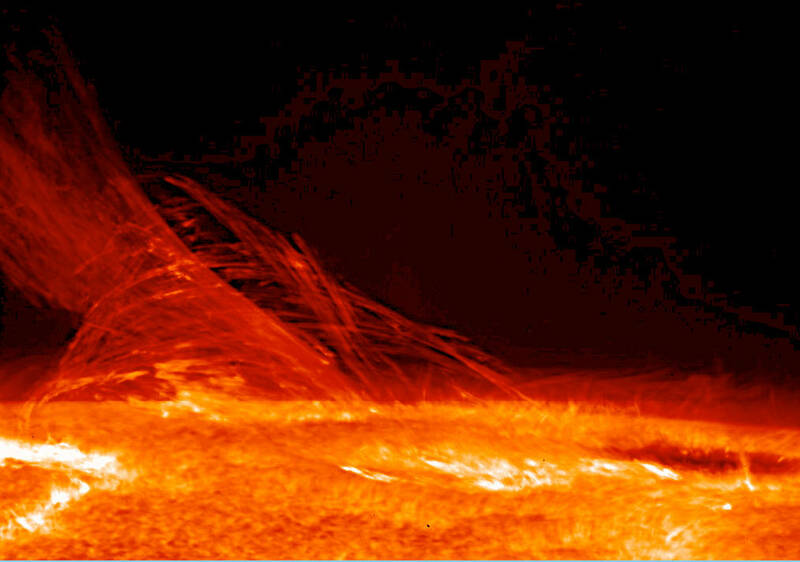 The Sun glows with a surface temperature of about 5,500 degrees Celsius (9,932 degrees Fahrenheit). On the other hand its hot outer layer, the corona, has a temperature of over a million degrees and ejects a wind of charged particles at a rate equivalent to about one-millionth of the moon’s mass each year. Some of these particles bombard the Earth, producing auroral glows and occasionally disrupting global communications. In between these two regions of the Sun is the chromosphere. Within this complex interface zone, only a few thousand kilometers deep, the density of the gas drops with height by a factor of about one million and the temperature increases. Almost all of the mechanical energy that drives solar activity is converted into heat and radiation within this interface zone. Charged particles are produced by the high temperatures of the gas, and their motions produce powerful, dynamic magnetic fields. Those field lines can sometimes break apart forcefully, but movement of the underlying charged particles often leads them to reconnect. There are two important, longstanding, and related questions about the hot solar wind: how is it heated, and how does the corona produce the wind? Astronomers suspect that magnetic reconnection in the chromosphere plays a key role. The scientists include for the first time the effects of incompletely ionized gas in lower temperature regions, certain particle-particle effects, and other details of the neutral and ionized gas interactions. They find that the neutral and ionized gas is well-coupled throughout the reconnection region, and conclude that reconnection can often occur in the cooler portions of the zone. They also note that new, high-resolution solar telescopes are capable of studying smaller and smaller regions of low ionization for which their results are particularly applicable.